After receiving a full briefing about the trip from the guys at ExploreIndoChina we were all very excited to start the trip. At exactly 8:00am the next morning we were picked up by our guides and a very cool jeep. 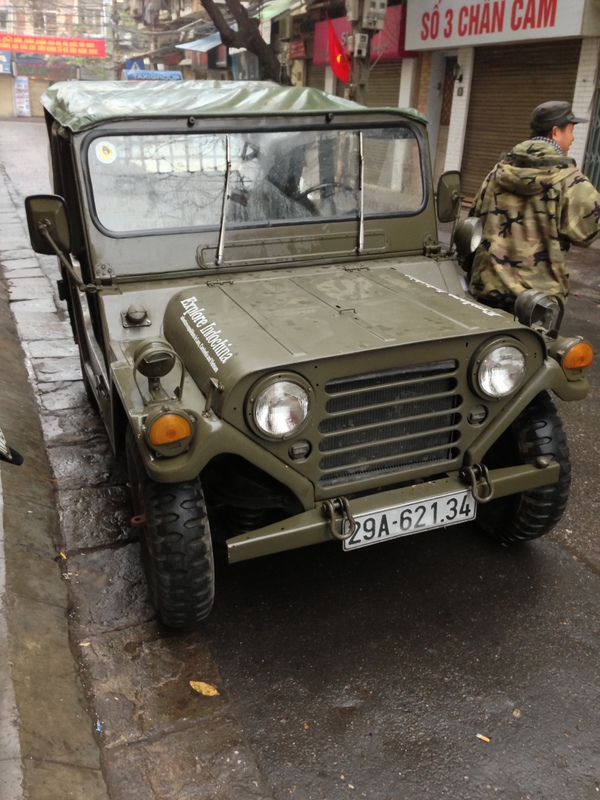 We set off to the garage where we met our new best friends, the 125CC Minsk. After a quick introduction to the basics of riding a motorbike in Vietnam, for example “use your horn in any situation”, “the gears are different – first gear is up, the others have to be pressed down (exactly opposite to a normal motorbike) we packed our stuff and set off. Our first challenge was to get out of Hanoi unhurt. That’s easier said than done. There are no traffic signs, traffic lights seem to have decorative purposes only and despite being the new year, billions of two wheelers were on the road, all with the sole intention to kill us. With the help of our guides we made it to the countryside. And despite the dreadful rainy weather we had a great time. Vietnam is staggering beautiful! And riding on a bike past rice fields, through small villages passing by waving children is a complete different experience compared to being on a car or bus. When riding a bike you’re just connected differently with the people and nature around you. We stopped at a scenic spot with a staggering view! At least we were told the view is fantastic. The problem was, that we couldn’t see anything at all really. 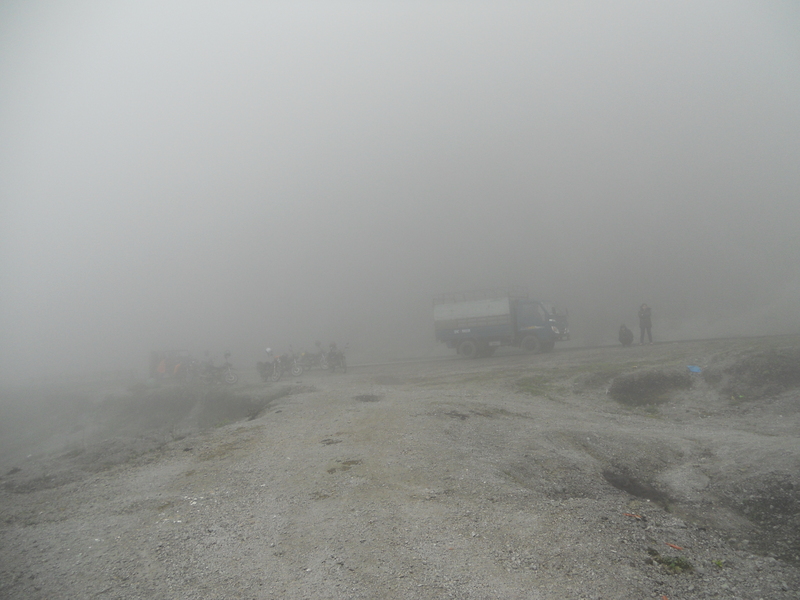 The fog was so dense, you could hardly see 10 metres. Not knowing what to do, we decided to have our lunch break there. The guys of ExploreIndoChina kept their promise, the food was outstanding! No one of us thought that we could enjoy pate, salami, sausage and french cheese somewhere in Vietnam’s countryside. It was imply delicious! We were also quite an attraction there, some serious drunk local (the Tek New Year seems to be the time to booze) came around and insisted to take a photo with all of us. We continued our ride reached the village of Mai Chau just in the afternoon. Mai Chau is home to the Thai ethnic minority in Vietnam. A particular feature of this area is the unique way the Thai build their homes. The stilt houses are made of timber and bamboo and about 2 to 3 metres above ground. The first time I walked into the room upstairs where we spent the night I was in for a shock. The “floor” consist of bamboo poles with a 30cm to 50cm gap between the poles. A “carpet” of dried bamboo leaves is thrown on top. I was a bit sceptical at first whether the construction can withstand a fat European. But it did. Even standing on one foot and jumping up and down wasn’t a problem. We spent the afternoon walking through the countryside before being summoned to a most sumptuous meal. We enjoyed some truly fantastic food. Starting from grilled pork to freshly made delicious spring rolls and fish prepared with banana leaves and steamed in bamboo for four hours. It was too good to be true! Words can’t do justice to what we saw so I just let the photos speak for themselves. After our dinner we ended the day with Vietnamese wine and scotch. Little did we know what would happen on Day 2…. AMAZING!!! oh boy, do I want to take such a trip now, after seeing this…. You really should, it’s worth the experience. 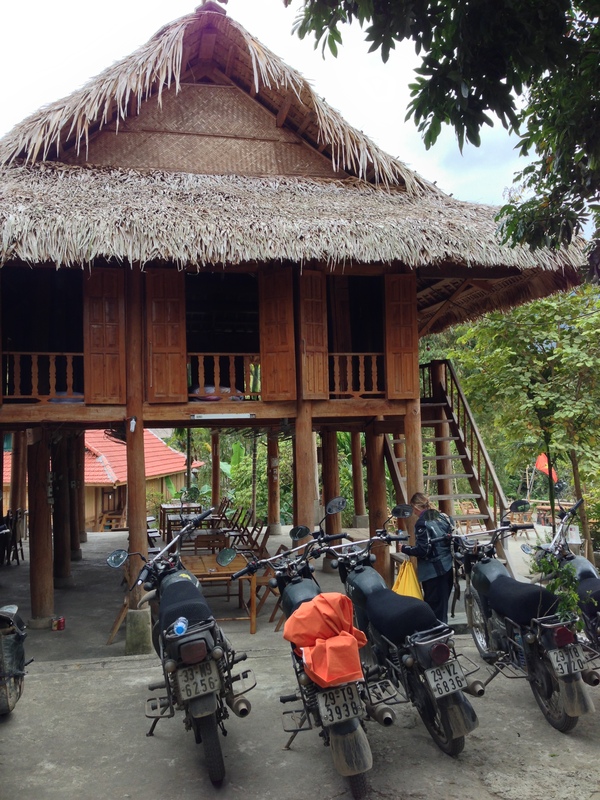 It’s also not that pricy, the three days motorbiking including accommodation, food, motorbike and guides are just around USD 550. Reblogged this on Motorcycling in Hong Kong.